Hugh obtained his B.Sc. in Mathematics in 1990 at Acadia University; he then went to the University of Waterloo where he obtained his M.Sc. in 1991 and his Ph.D. in 1994, both in Statistics. His Ph.D. thesis was written under the supervision of C. F. J. Wu and M. S. Hamada. He was then appointed in the Graduate School of Business of the University of Chicago as an assistant professor. He stayed in Chicago for three years and came back to Canada, at the University of Waterloo in 1997. He spent seven years in Waterloo, as an assistant and an associate professor. In 2004 he obtained a Tier II Canada Research Chair in Mathematical Modeling at the University of Acadia where he was promoted a full professor in 2006. In 2002 he went to Stanford University as a visiting associate professor. Hugh holds research grants from the Natural Sciences and Engineering Research Council (NSERC), MITACS (Mathematics of Information Technology and Complex Systems), NICDS (National Institute for Complex Data Structure), and CFI (Canada Foundation for Innovation). These grants are a tribute to his excellence in research and show the breadth of his scientific activities. Hugh has one brother who owns an information technology consulting business in Halifax. He is married to Tania, who keeps him grounded in reality. They have two sons, Max and Jack, whose hobbies include music, outdoor activities, and lego. Hugh and his family are lucky to live in the beautiful Annapolis Valley area of Nova Scotia, close to parents on both sides. Hugh's father, Fred, is a retired professor of Mathematics at Acadia University. Hugh did manage to take one undergraduate course from his father (he passed the course). The development of the Bayesian approach to CART modeling is one of Hugh’s major accomplishments; it influenced the exploding area of Bayesian nonparametrics. This was particularly notable as he took the original recursive partitioning CART approach, which was primarily an exploratory data analytic tool, extended it to be a model, developed general prior distributions for the space of all CART models, and then implemented an MCMC (Markov Chain Monte Carlo) approach for posterior computation and exploration. This was followed by important contributions such as Bayesian tree modeling and Bayesian Adaptive Regression Trees, a Bayesian ensemble learning approach that has proved to be remarkably powerful for finding low dimensional structure in high dimensional data. Hugh has served on the NSERC selection committee in statistics. 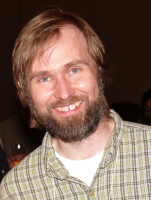 He has been an Associate Editor for the Canadian Journal of Statistics, Technometrics, and Statistics and Computing. He has refereed papers in numerous scientific journals. Statistica Sinica has recognized the quality of his editorial work by giving him an award for quality and timely referee reports. He has been a member of several international scientific advisory boards such as ACEnet, the Exploratory Centre for Chemoinformatics Research (North Carolina State University), and Genome Canada Artic project. In addition, he made important contributions to the training of highly qualified personnel; he has supervised 3 postdoctoral fellows, 4 Ph.D.’s and 10 Master’s students. Hugh Chipman has advanced the statistical sciences in a broad range of areas by providing novel modelling methods. His work will have a large impact on the development of statistical methodology and its applications for many years. Hugh Chipman is the eleventh recipient of the CRM-SSC Prize. Previous winners of the award were Christian Genest (Laval), Robert J. Tibshirani (Stanford), Colleen D. Cutler (Waterloo), Larry A. Wasserman (Carnegie-Mellon), Charmaine B. Dean (Simon Fraser), Randy Sitter (Simon Fraser), Jiahua Chen (Waterloo), Jeffrey S. Rosenthal (Toronto), Richard J. Cook (Waterloo), and Paul Gustafson (UBC). "For outstanding contributions to non parametric Bayesian statistical inference and non parametric wavelet regression, for his extension of statistical techniques based on Classification and Regression Trees and his innovations in discriminant and cluster analysis, for interdisciplinary research in bioinformatics and machine learning, as well as for the training of graduate students."